Among the success stories that were linked to the humongous growth of social networking, Reid Hoffman’s is one. After all, he is the founder of one of the largest professional networking sites in the world, ‘Linkedin’. Hoffman is also an internet entrepreneur, a venture capitalist and an author who has written quite a few inspiring books.Hoffman had a childhood that was in no way indicative of the future he had as a networking entrepreneur. He studied epistemology and was also into farming for a while during his high school days and a little after that. Later, he got into the prestigious Stanford University from where he graduated with a B.S in symbolic systems and cognitive science. An M.A in philosophy from the Oxford University followed.It was Hoffman’s dream to influence the world on a big scale, which is why he thought academia was the right profession for him. He later decided that he wanted to pursue a career as an entrepreneur instead. Reid bagged a job in Apple computers in 1994 and worked on eWorld, which was one of the first attempts at social networking. PayPal, an electronic money transmission service was where he worked next and with all the talent that he’s exhibited in the field of networking, he quickly climbed up the ladder at PayPal to become the Vice President of the company by the time it was sold to ebay in 2002.All the professional experience he gained while at PayPal and all the external contacts that he got for himself during the time helped him in the establishment of LinkedIn along with his two other friends. LinkedIn then began operating in 2003, and quickly became a humongous success with 332 million users from 200 countries using it, as of 2014. 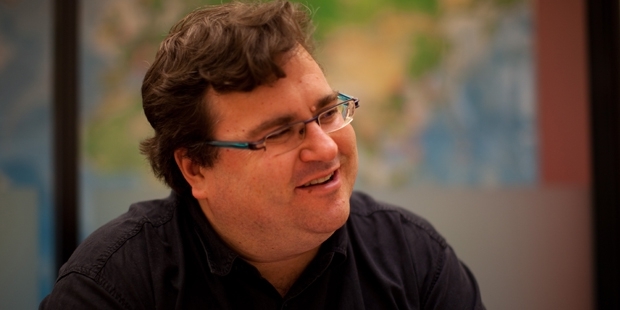 The shrewd businessman that he is is, Reid Hoffman started investing shortly after LinkedIn's success into nearly 30 to 40 internet businesses - Flickr, Wikia, Coupons, Xapo, OneKingsLane, Edmodo and Wrapp being some of them. Hoffman also got the opportunity to live up to his initial dream of changing the world by lecturing by all his motivational speeches and books later in his life. He also blogs on LinkedIn as ‘LinkedinInfluencr’at times. Hoffman’s ‘The Start-Up Of You’, one of his books on business venturing is highly acclaimed by his followers. The book went on to become a New York Times best seller.Hoffman has always motivated his followers to think big. One of his famous entrepreneurial quotes goes, “Every internet entrepreneur should answer these questions: How do we get to one million users? Then how do we get to ten million users? Then how will you get them engaged deeply?”. This says it all.